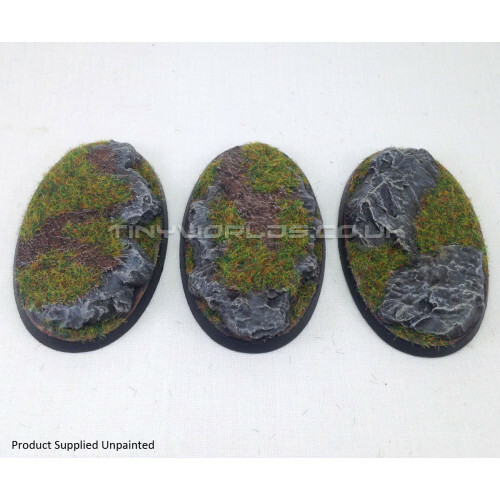 A set of 3 detailed oval miniature base featuring a rocky landscape texture suitable for many fantasy and sci-fi table top wargames . 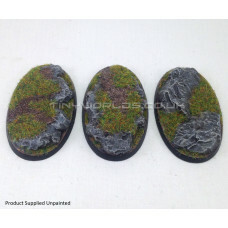 These bases measure approximately 75mm x 42mm and are the perfect way to finish off a great miniature for your army. These are the same size as those supplied with some of the larger cavalry models such as Pegasus or Demigryph Knights made by Games Workshop. Some people refer to these bases as 45 x 75mm Oval size. Made from a durable cast polyurethane resin, this base is sold unpainted and without flock. Painted samples shown to clarify detail and present the achievable completed item. The bases are straightforward to paint with a superb level of detail and can be freely mixed with bases made by numerous other manufacturers to create a one-of-a-kind army.